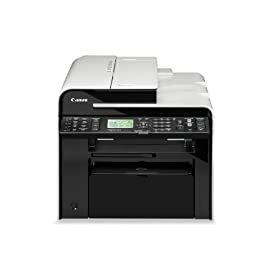 The imageCLASS MF4890dw is a powerful, high quality multifunction wireless printer with quick printing features of 26 ppm, a 50-sheet DADF and all mode two sided printing. This compact machine will fit anywhere in your home or office and offers great new technologies such as the tiltable control panel, quiet mode and simple solution keys. The MF4890dw also offers the convenience of wireless capabilities, giving you the opportunity to print from almost anywhere in your home or small office. Crisp black and white documents arrive in approximately 5.8 seconds with Canon’s Quick First Print while originals will output at up to 26 pages-per-minute. Maximize time. A 250-sheet cassette, 50-sheet duplex ADF plus single sheet multipurpose tray means you spend less time re-filling paper. Easily connect to a network through a built-in Ethernet port, so everyone can easily share printing directly from their PC. With IP address filtering and MAC address filtering, you’ll prevent unwanted users from gaining access to your network and your confidential data. Print from almost anywhere in your home or office. The 50-Sheet Duplex Automatic Document (DADF) feeder lets you print, color scan or copy one-or two sided originals to produce two-sided output with ease. Easily create copies of your identification cards or other small documents like passports to keep for your records on a one-sided document. 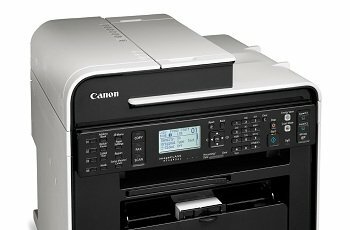 Canon’s Single Cartridge System is a convenient all-in-one consumable that when replaced, rejuvenates the entire imaging process for consistent imaging quality. The intelligent Energy Saver Mode reduces your power consumption to just 2.1W of power and this machine meets Energy Star guidelines. Which Laser Printer Is Right For You? Energy Consumption Approx. 520 W (during operation), Approx.